This sweeping recasting of American naval history is a bold departure from the conventional “sea power” approach. 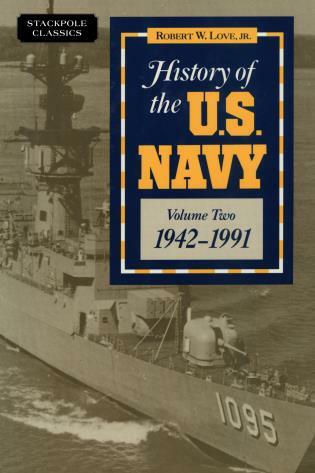 Volume Two of History of the U.S. Navy shows how the Navy in World War II helped to upset the traditional balance in Europe and Asia. Days after Pearl Harbor, Admiral Ernest J. King took command of a navy overwhelmed by the demands of war. King devised grand strategies to defeat the Axis and promoted a cadre of fighting admirals—Halsey, Spruance, Hewitt, Kincaid, and Turner—who waged unprecedented in complexity and violence. New sources provide an entirely fresh look at the Battle of the Atlantic, the invasion of Europe, and the great naval campaigns in the Pacific. This book contains the first comprehensive interpretation of the U.S. Navy’s role in the Cold War, when the United States found itself the global bailiff. Love demonstrated that the Navy’s abiding priority was to capture and maintain a share of the strategic bombardment mission by building new ships, planes, submarines, and mission to deliver nuclear weapons. The dawn of the New World Oder found the Navy still on duty as the mailed fist of American foreign policy, standing watch in the Persian Gulf and, at the same time, off the coast of West Africa during Liberia’s violent civil war. Fresh challenges, the author argues, call for a newly balanced fleet and continued attention to America’s first line of defense. Robert W. Love, Jr., has taught American naval history and recent military history at the United States Naval Academy since 1976. He earned his doctorate at the University of California at Davis. Love is the editor and co-author of Chiefs of Naval Operations and editor and co-author of Interpretations and New Sources in Naval History. His forthcoming book, Passage to Pearl Harbor, is the first in a multi-volume study of the U.S. Navy in the era of Fleet Admiral Ernest J. King. Professor Love is editor and co-author of the forthcoming Chiefs of Staff of the U.S. Army. He and his family live in Annapolis Maryland.